Latest News From Roy: 36th Convention – Latest Details! 36th Convention – Latest Details! PLEASE remember the date has been changed to Saturday 10th October 2015, even though the actual tickets still state the 19th September. Since the last posting and also the write up for Beach Boys Stomp Magazine 142, which should have been published by now, yes honestly! However it should certainly see the light of day this month. As you will all or nearly all be aware the B.W.T. U.K. dates for September have been cancelled or perhaps postponed would sound more positive? Brian has said 2016 will be his final European tour and as he has passed beyond the ten years he mentioned in 2002, this is not bad going? When you consider all the quite wonderful positives which have taken place here in England, it has been the most wonderful journey for Brian and his music. The most, quite spectacular 6 nights in 2004 with the long awaited release of ‘Smile’ and in the central stalls for two nights (?) were not only Sir George Martin but also Sir Paul McCartney. To top all this was the world premier of the CD at the Convention in London the following September. We should not in anyway forget the simply out standing contribution to all this, of ALL the musicians who have supported Brian during this time. In fact for this writer, this is the most impressive aspect of the B.W.T. the kindness, friendship and love which exsists within the party. 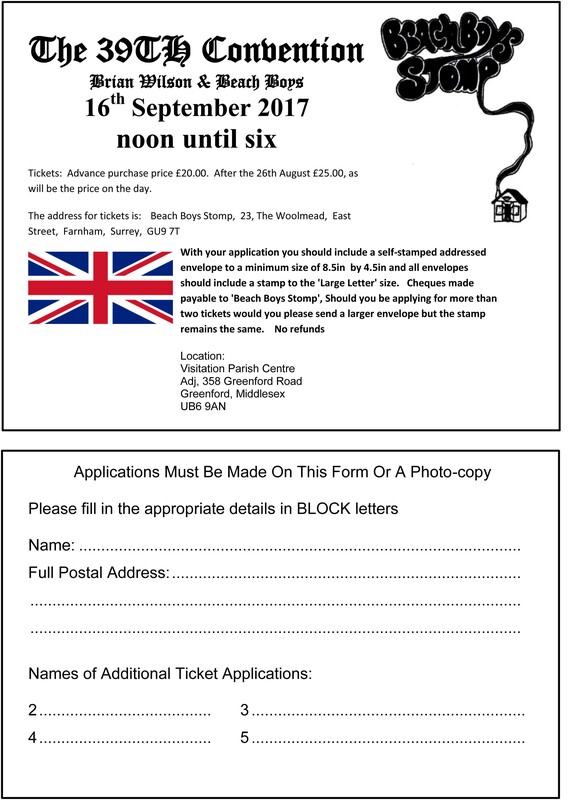 Not without problems this year the badges were collected last Thursday, the 30th July so we are now in the process of sending out tickets and badges which have been applied for. It is still the intention to list not only the raffle items (or at least most of them) on the web-site but also the pieces for Auction as well. Plus there will be a hand-out programme sheet which will be provided by Geoff Gilborson on the day. Which will also list all the items, so if anyone has to leave early they can mark any prizes in the raffle they might be interested in. Thus we avoid the problems of last year. PLEASE do remember the date has been changed to Saturday 10th October 2015, not as on the actual tickets the 19th September. As I am sure most or all of you are aware the date originally set for the 36th event has been taken by one of the dates for the latest tour by Brian and his band. On the actual Saturday they are in fact in Cardiff. Had this been the London date, it could have made for an interesting part of the day’s events. To what extent I am not quite sure, but where there is a will there is a way. Although initially we were reluctant to alter the date in the end this did seem to be the best way forward. All being well, the Convention date for 2016 will be Saturday 17th September. This is the third Saturday in September as it should be. Date; – Saturday 10th October 2015. Tickets;- Applications are now invited for tickets for the 36th event and are priced at £20-00 per person until the 15th September, after which they will be £25-00 each up to and including Convention day. Please make cheques payable to ‘Beach Boys Stomp’ enclosing a stamped and self addressed envelope to a minimum size of 8.5″ x 4.25″. PLEASE be very careful with this as anything smaller does create problems. If you are applying for more than TWO tickets would you please send a larger envelope and put a ‘large letter’ stamp on it. A booking form will be printed elsewhere. Please make sure you list the names of all applicants. The address for tickets is 23, The Woolmead, East Street, Farnham, Surrey, GU9 7TT. Badges;- Will follow the normal format but this year and will be back to the usual run of 100 pieces. Entry;- The doors open at 11 o’clock for the customary warm up period of one hour before the Convention commences with the introduction being at 12 mid-day. Then it will be the normal six hour run finishing at 6 o’clock, sharp! Visitation Parish Centre, adjoining 358, Greenford Road, Greenford, Middlesex, UB6 9AN. Tables ;- The hiring of tables is now open to anyone who wants one. They measure 4′ by 2′ and are available at £35-00 each. To previous hirers and Stomp subscribers they cost £22 50 each. After the 15th September they are £35-00 to all. Please apply to the ‘Beach Boys Stomp’ address and enclose as S.S.A.E. In order to hire a table you must also purchase a day ticket. Auction; – All being well items will not only be listed on the web-site but also in an ‘on the day programme leaflet’ ( a suggestion by Geoff Gilborson). Several items have been left over from 2014 and all being well we will be able to offer one or two others. Raffle; – The ‘autographs’ idea for all the raffle prizes of the last few years has been very well received and we will continue with this format as long as we can. Please do remember the majority of the items autographed are NOT originals, most are photo-copies. The autographs are real. As a number of you who were at Greenford last year will remember not all the prizes were claimed. Although the missing numbers were placed on the web-site, none were taken. So for 2015 Geoff Gilborson has offered to produce a small information leaflet which will have all the intended prizes listed. If the event does over run you will be asked to list your prize preferences before you leave the venue. Data Protection Act;- Introduced in 2007 so we would hope you are all aware of this. If you do not wish to have your picture taken and possibly printed in the magazine after a Convention. It is your responsibility to avoid Brain Clarke taking your picture. If you are not looking at the camera, or are part of a group photograph, then this D.P.A. does not apply. Refreshments – Hopefully, as previously, the Centre will be able to provide light refreshments but this should be confirmed nearer the time. Please remember no-one is permitted to bring their own alcoholic drinks or other purchased drinks onto the premises!!! Special Guest; – A change of ‘Special Guest’ has taken place for 2015 and we were very lucky to be able to overcome the problem caused by the change of date, in this situation. We now have immense pleasure in announcing that we will be joined by Mr. Bobby Figueroa who will be accompanied by his new wife Mrs. Jo-Anne Figueroa. Their attendance at the 36th Convention will in fact be part of their honeymoon. Interestingly enough Jo-Anne has in the past organised American Beach Boy fan conventions. So as usual, questions on the day in writing and also NO questions which relate in any way to a certain Mr. M!! Timetable; – It is intended to place this both on the web-site and in the magazine before October. On the day it will be in the Convention leaflet. Mobile Telephones; – The use of mobile telephones within any part of the event building is not permitted. Should you wish to receive or make a call you are asked to go outside the building. Copyright; – Several years ago there was a significant problem relating to one of the Conventions and so entire event is now ‘copyrighted to Beach Boys Stomp’! No part of the event in any form – audio, print, photographic or film may be used in any form of re-production for promotion or reward without in the first instance seeking permission from ‘Beach Boys Stomp’ at the usual address. THE ORGANIZERS RESERVE THE RIGHT TO MAKE ANY ALTERATIONS OR ADJUSTMENTS THEY DEEM NECESSARY WITHOUT NOTICE!!!!! Further information or updates will be posted on the web-site when and as they become available. Roy Gudge Monday 25th May 2015.